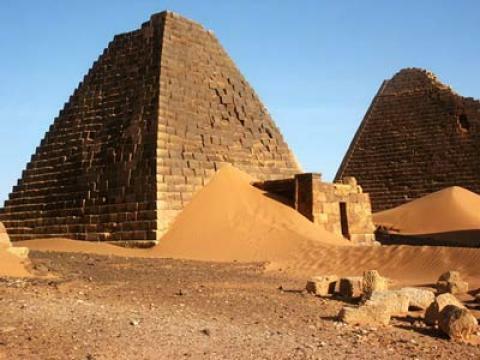 The ruins of this royal cemetery tell the history of the end of the reign of Meroe's pharaohs who ruled from the 500s BC to the 300s AD in preserved hieroglyphics and ancient architecture. Although they are reported not to be quite as spectacular as their counterparts in Egypt, the pyramids at Meroe are nonetheless incredible - and far less touristy. Nearby luxury accommodations and desert campsites provide visitors with the opportunity to sleep under the desert stars. Take a minibus to Atbara from bus station in Bahri (Khartoum North); ask to get out at Al-Ahram (Pyramids), then walk half a mile.